Biology is the study of life and living organisms, ranging from bacteria to plants to humans. Relevant hands-on biology experiments help improve your understanding and engage you in the learning process and are more enjoyable than memorizing terms from a textbook. Experiments investigate topics such as cell metabolism, genetic inheritance, photosynthesis and bacterial colonization. All living cells must convert energy from large nutrients, such as sugar, into cellular energy to fuel processes and synthesize new molecules. While oxygen availability enables efficient cellular energy production, cells can also produce energy without oxygen using glycolysis followed by fermentation. This experiment investigates how different sugar concentration affects the rate of alcoholic fermentation in yeast, which is measured by the depth of the layer of bubbles trapped in foam at the top of the yeast. Children tend to resemble their parents because they inherit genes, segments of DNA molecules that contain instructions for making proteins. Each parent has two versions of a given gene, called alleles, and randomly pass one of these alleles to their offspring. This experiment will use two two-sided coins to simulate gene inheritance from two parents that are heterozygous for the gene, meaning that they both have two different alleles for a given gene. The heads side of the coin represents one allele, whereas the tails side of the coin represents the other allele. Toss both coins four times and record the resulting allele combinations. Repeat these four pairs of coin tosses two or three more times to determine the frequency of the different possible allele combinations. Plants convert light energy into chemical energy in a process called photosynthesis. During this process, plants take up carbon dioxide and let out oxygen. This experiment will determine how the light intensity and color each influence photosynthesis rate, which is assessed by the number of oxygen bubbles produced by the plant. Place waterweed plants in a container with water and baking soda, which provides carbon needed for photosynthesis. Use a simulator, an instrument in which the carbon dioxide availability, light intensity and light color can be adjusted, to assess how each of these factors influence photosynthesis rate. This experiment cultures bacteria present on different surfaces on an agar plate. 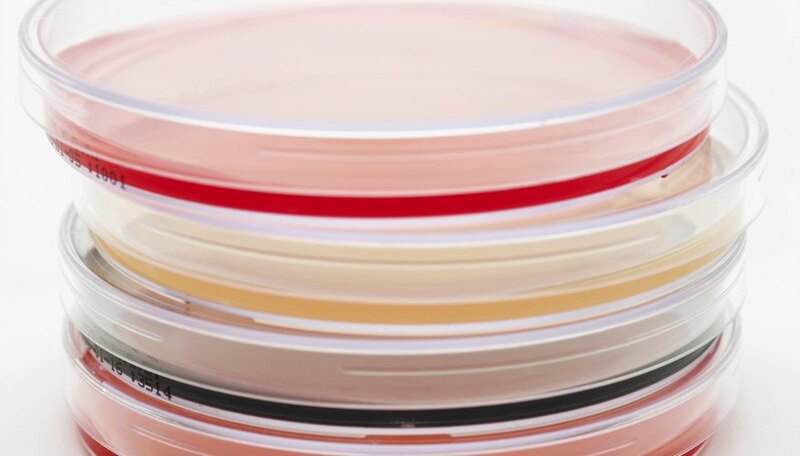 Agar is a common growth medium for bacteria because it isn’t eaten by the bacteria growing on it. Use sterile cotton swabs to obtain bacteria samples from various locations such as your desk, the floor, your hair, your unwashed hand and your hand after using an alcohol-based disinfectant. Put each of these samples into individual agar plates, or you can divide a single agar plate into sections if supplies are limited. Observe the bacterial colony shape, size, margin edge, elevation, color and texture over the next several days using a microscope and/or photographs. Battaglia, Gina. "Types of Biology Experiments." Sciencing, https://sciencing.com/types-biology-experiments-6658.html. 25 April 2017.